The river is an ever-present reality around the Greenwich Peninsula. Sometimes, when floods seemed likely, that reality became a threat. The Greenwich Peninsula’s real name is ‘Greenwich Marsh’ where a network of sluices was built, probably, in the Middle Ages. Flood defences along the riverbank are always referred to as the ‘sea wall’ – a term which reflects the potential dangers of the tides. It is difficult to know when the original embankments against the sea were built – since they are mentioned in a document dating back to 1290. In 1528 they are referred to as the banks ‘which had anciently been raised’. I would be very interested if any Bygone Kent reader could tell me anything about the age of the sea wall. Clearly it is a very important structure, and, as the remainder of this article will show, requires the very best of engineering expertise. Without it much of the landscape of Thameside would not exist, as we know it. Most of the records about the sea walls refer to times when the river had broken through. One early instance is in 1297 when there was a ‘certain breach made in the bank betwixt Greenwich and Woolwich by the violence of the tides’. The problem usually was less a question of getting the breach mended than of persuading the locals to pay for the work. From the 1620s the marshland was managed by the ‘Marsh Court’ or ‘Court of Sewers’ consisting of landholders and other interested parties who raised the ‘Wall Scot’ (the local rate) and employed a small staff. A very full set of minutes for this body exists from 1625, which detail the care that had to be taken to maintain the marsh properly and keep the river out. This article is about one instance of a breach in the sea wall. In October 1825 it became clear that a section of sea wall had become very unsafe and was threatening to give way. At the time two plans were drawn but they don’t give enough detail to be able to pinpoint the spot exactly. One appears to show it on the tip of the peninsula but, since the site was said to be ‘opposite the Folly House at Blackwall’, it may well have been on the western side of the peninsula at the southern end of the old Delta Works site. . It appears that the problem was caused by a slight projection which made an irregularity in the line of the sea wall and a breach was threatened. The Marsh Court had immediate legal problems in dealing with this because, not only was the work urgent and expensive, but members were unsure of their powers to acquire the site and have the remedial work done. Could they go ahead and buy the three acres of land, which were affected? If so how should they raise the money? Or did they need to get a private Act of Parliament first, to give them the powers to do the work? That would be the proper way to proceed but it would take time and the work was urgent. First they looked at ‘Callis’. This was Robert Callis’ ‘Reading upon the Statute of Sewers’ originally published in 1685. It had been edited and reissued as recently as 1824 – but perhaps the Greenwich Commission did not have the new edition. They found that that authority was ‘full of doubt and contradiction’ and so they sought a legal opinion. Unfortunately the barrister who they consulted also gave an opinion that the matter was not clear and he told them to get another opinion. The Court also began negotiations with the owners of the site – because there was an issue of land reclamation they felt it was important to acquire it. It was occupied by a Mr. Newman, a butcher who used the land for grazing, and the Commission had had the impression that he was the owner. This was not so. The land was actually owned by a Mr. Powis. It was decided in due course that it would be simpler and quicker for all the landowners to sign an agreement allowing the commissioners to buy the land and that they would also agree for each of the landowners to pay a sum of money. It was suggested that the actual purchaser should be Morden College, the wealthy charity that already owned a great deal of land in this area. An estimate for the work was sought from John Rennie. This is the younger Rennie whose more famous father had died four years previously. He was currently involved, among other things, in completing his father’s work on London Bridge. In the future he was to undertake many projects involving marshland reclamation in the fens but he had already been appointed as Chief Drainage Engineer for the Eau Brink so that drainage, and perhaps embankment, was already an interest of his. Two months later Mr. Bicknell, solicitor to the Commissioners gave an update on information obtained to a meeting at the Green Man at the top of Blackheath Hill. This meeting was packed with representatives of local interests. Rennie reported on what he thought was the cause of the problem. Rennie felt that the great variation in tides throughout the year ‘tends to carry the bank away’ and that previous remedial work – ‘a wooden framing consisting of poles and land ties’ together with ‘several hundred tons of Kentish ragstone’ was making it worse. The wall would have to be rebuilt. The Court was not impressed with the cost of Rennie’s estimate and asked if he could find an alternative, and cheaper, way to solve the problem. Rennie made a second site visit and reported a few days later. He said that the only other possible alternative scheme – to use piling would be even more expensive. He then sent in his bill for this second consultation. Meanwhile the Court had asked if a report could be obtained from Thomas Telford. He was at, the age of seventy, nearing the end of his long career. He was the ‘undisputed head of the civil engineering profession in Britain’. He had considerable experience in the Fens and was soon to work with John Rennie Jnr. there. The meeting at the Green Man had, however, asked for the most prestigious engineer that they could. Telford too made a site visit. He to pointed out that the exposed position of the portion of bank which had caused the problem. The river narrows slightly at this point and he also drew attention to the new West India docks and the number of vessels which were ‘frequently moored adjacent to their entrance’ constricting the flow of water. The river thus rose with ‘increased violence’ and was ‘continually grinding the soft matter from the bottom’. He felt that there was an imminent danger of a breach in the wall. Neither engineer mentioned the Blackwall Rock which had been removed from the northern side of the river about twenty years previously. Telford, Rennie and the members of the Court of Sewers all thought that the activities of lightermen employed by the City of London and Trinity House were not helping. It was alleged by everyone that material was being removed from the foreshore in this area for use as ballast. The Commission duly wrote to those authorities to point this out asking if this had been going on. Replies, from the Lord Mayor and the Elder Brethren, were, predictably, non-committal. Telford was however asked to do the work. The archive includes his detailed specification. The work basically consisted of a new earth bank built in such a way as to make the line of the sea wall completely smooth. There was to be a drain at the bottom of the inner slope and the whole structure covered in turf. The work was to be supervised by the Commission’s Wall Reeve who received an enhanced salary for the job. Two contractors tendered for the work Thomas Cotsworth of Dover Road, Southwark submitted a price of £2,100 and Simmons of Bromley, Kent, who got the job, for under £900. The work was finished by the summer of 1826, apparently without problems, Telford’s final inspection took place and his certificate of completion was issued in July. A dry dock was built in this part of the peninsula in the 1870s but otherwise it is likely that the line of the bank is much as Telford left it, although a considerable amount work must have been done to the wall itself in the intervening years. A year later in July 1827 Telford wrote to remind the Commissioners that he still had not been paid for the job. It was around the same time that Telford, in the company of Rennie; working on the Nene outfall in the Fens was to catch a severe chill, the first sign that he was beginning to fail with age. Telford was not alone in not having been paid his services – a series of letters had already been received from Rennie. These concerned his bill for £30 in respect of the second estimate, a sum that the Commissioners refused to pay. In October 1826 Rennie had written to say that he had been in Ireland but that his brother, George, had informed him of the outstanding bill. He wrote to them that he had ‘charged only what I conceive myself entitled to’ and in April 1827 that ‘nothing annoys me more than disputes about money matters’. The Commissioners recorded that they ‘did not find it necessary to alter their first determination’. Within the next few months the Commissioners also received claims for compensation for late payment from the original landowners. This was a Mr.Richard Powis. The original owner had been his father who had just died – Powis wanted £50 as compensation for late payment. There is just the suspicion that this archive might have survived because of the arguments over payment. The job must have been a relatively small one for Telford and Rennie, but very important in terms of Thames flood prevention. Few visitors to Greenwich will realise how the care and maintenance by the Marsh Court, its predecessors and successors, over many centuries has kept the land safe and made development of the area today possible. This article has been prepared from archive material in the Greenwich Commission of Sewers archive plus some material on ‘imbanking and draining’ in the possession of Woodlands Local History Library. Biographies of Telford and Rennie have also been consulted. Extract from report prepared by the London Rivers Association 1980s. This operation largely caters for the building requirements of the parent company. All road stone is imported by ship – about arrival a week is currently required, other raw materials for asphalt production are brought in by road. There is considerable local sensitivity about the lorry movements that this operation produces. The firm is known to be currently negotiating about sites in the Charlton Riverside area. It is believed that they are interested in a somewhat larger site than they are currently occupying (two acres). They would need good river access rot no rail access. This firm that has been in the Borough for more than four decades is on the point of departing. The last barge to have been repaired in this yard left in December 19~6. The workforce of five were laid off and the company owners are reluctantly looking round for potential buyers. This firm which is engaged in producing sophisticated armaments for submarines has not used its wharf for over a decade and is unlikely to do so in future. Unfortunately there is no separate vehicle access to the wharf and for security reasons access through the site is unlikely to be granted. There should be some discussion about; the future use of this wharf which is in relatively good condition and has good depth of water. This is the only wharf in the Borough that handles containers. Currently over 40,000 boxes a year passes through the 40 acre site. This is somewhat up on previous years but is nowhere near the full capacity of the site. The terminal has two modern gantry cranes and large 279 metre berths. In the past few years the company has given up operating a shift system and undertaking groupage on site. Employment has fallen from 75 dockworkers and 60 staff four years ago to 20 and 30 respectively today. Two shipping lines account for almost all of their traffic – Bell Lines and Seacon. Both these are currently expanding and are happy with the service provided. The management are worried that by going out to attract new traffic they could alienate their long-standing customers. The company’s biggest problem is the size of their site and their rate bill (over £200,000 per annum). They are looking for a compatible tenant for part of their site and are campaigning for all ports to be assessed for rates on the same basis. This is the largest sea dredged aggregates firm to operate on the Thames. It has recently purchased the Delta Wharf site (aver 4 acres) with a view to using it to land and process sea dredged sand and gravel. At present it has a large plant and headquarters at Purfleet but feels that it needs a processing plant on the south side of the river. The company operates t\«) 5CXX) ten sand and gravel dredgers. If it can find new processing sites it will invest in further in vessels. It considers that increasingly building materials such as sand and gravel will have to be obtained from the sea bed because of environmental objections to the use of land derived sources. At present the economics are finely balanced. Marine dredged aggregates are more expensive to mine but cheaper to transport. This gives a premium to landing these aggregates as near as possible to the end use. The first planning application was turned down because of objections from the houses that are close by and because of a concern that the operation might not generate a significant amount of new employment. A second planning application has been recently presented which the applicants hope will be more acceptable as it involves a smaller site within the S8IOO employment levels and will free parts of the 5 acre site for other employment generating uses. This old established barge and boat building firm is occupying a one and a half acre site on the above Civil and Marine freehold. They moved here three years ago after being ousted from their premises in the Royal Docks by the PLA. They have successfully moved into boat building and repair and employ 18 craftsmen and three apprentices. Their order books are full for the next two years having recently secured a large contract to build a 60 ton private cruiser. Their main problem is that they are currently occupying; their site on a licence and could be evicted at a moment notice. While it is understood that Civil and Marine are happy that this firm continues on the site, the lack of security affects the ability to plan for a long term future and the ability to secure finance from Banks. This area is let on short term leases to five firms none of which use the river. There are two wharves on the site which could be used in future for cargo handling. They have good water and road access. All the existing users have leases up to 1995 from British Gas which has said that they are interested in disposing of the site. Consideration should be given to its development for river related uses in the longer term. The whole site is over six acres. This has recently been bought by Brown and Mason a demolition firm which is currently demolishing the Power station and want to develop the site for their own benefit. The site is about three acres but; may well be seriously contaminated. The firm wants to develop for the highest value which they appear to believe is a high class residential development but are Prepared to talk about; other possibilities. It is believed that they acquired the site at a considerable discount because they were prepared to take on the Problems of asbestos on the site and the risk of contamination. Future of the gas works site. 1980s. This report is included with some reservations. The copy it was scanned from had no identifying marks as to authorship, origins or ownership. It appears to be a document commissioned, possibly by British Gas, on the history and future of the East Greenwich Gas Works site – and is thus of considerable interest. If someone feels they own the copyright please get in touch and it will be removed with an apology, or an acknowledgement inserted. 1.1 The earliest name that we know of is Lee Ness, which is likely to be of Anglo- Saxon origin, and mean ‘thinly wooded headland’ or ‘headland [covered] low-lying meadow’; it could also have been named by attraction from the river Lee which run northwards from the opposite bank of the Thames, whose name appears to derive from an ancient British river-name from a root meaning ‘light’ or just possibly ‘the river of the god Lugus’. .
1.2 Before a system of embanking was in place (by C17, probably earlier, and perhaps as early as the Roman period), this was a place of marsh, water-meadow, and reed- beds, and almost always liable to flooding .On the other hand, it was an ideal place for hunting wildfowl, and Henry VIII certainly hawked here from his palace of Placentia at Greenwich. Indeed, there is no reason not to expect that the Roman period inhabitants of the area (whether officials or natives) would have done likewise: there were, after all settlements of that date at Charlton, Woolwich, and Greenwich, and the main London-Dover road (Watling Street) ran within 2km of the south end of the peninsula. 1.3 During the Anglo-Saxon period Lee Ness was part of a large estate which would have been called Lieveshamscire (Lewisham-shire) and included Lewisham, Greenwich, Woolwich, Mottingham, and Combe. This estate belonged in 918 to Elstrudis, youngest daughter of King Alfred, and in 1006 was the subject of the document reproduced. Vow of Edward the Confessor as heir apparent to the throne In the early years of the eleventh century, the Danish fleet wintered at Greenwich (and, incidentally, slew Bishop Alphege over non-payment of ransom; at that spot, it is said, the church of St Alphege was built, now represented by the monumental C18 fabric of the old church of Greenwich) and forced the Thames up to London. 1.4 In 1588, Robert Adams drew a descriptive plan of the Thames, showing its defences (and Queen Elizabeth’s route to her famous Tilbury speech), among which are shown a bastion at Lee Ness connected by a pontoon barrier to one of the north bank at Blackwall, clearly sited not only to form a final line of defence before the City, but also to command the mouth of the river Lee which was an important navigable channel. [It should be noted that there has been no search of the records for references to this defence line, so that at the moment this plan remains the sole evidence for its existence.] Its appearance would be not dissimilar the Italian engineer Gianibelli’s 1588 design for defences at Tilbury. 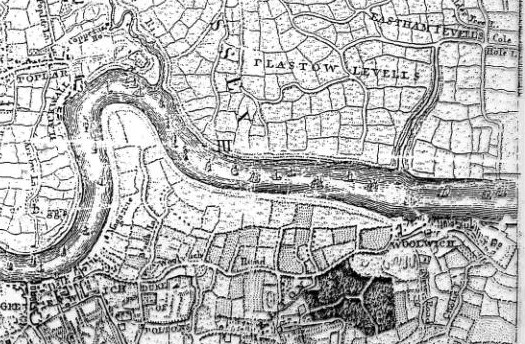 1.5 By 1695 when Samuel Travers, HM Surveyor General, compiled a plan of ‘the King’s Lordship or Manor of East Greenwich’, the peninsula was wholly protected from flooding and had been divided up into fields, with a Watch House in the centre of the northern part. The only other building shown is the New Magazine, which by 1760 was in such a dangerous condition that it was declared unsafe; it lasted however until 1802 before being demolished. [There were constant petitions to Parliament in the early C18 for its removal because of the danger of explosion.] The C18 also saw the removal of Execution Dock from Wapping to a point on the west side of the peninsula. This iron-caged gallows can be seen in a 1782 view from Blackwall (figure 6). Towards the end of that century a tide-mill was erected on the east side just north of the river end of the modern River Way. This was the site of a serious explosion of a high-pressure boiler installed by Trevithick, which led to improvements in boiler design, and thus a footnote in the history of steam engineering. When the early/mid-Victorian entrepreneurs needed to expand from their cramped quarters in and around the City, the peninsula offered an ideal greenfield site, and by 1874 the Thames Conservancy’s river plans show a whole series of such works. On the west side (running selectively northwards), were at Enderby’s Wharf [now owned by STC] and Morden Wharf. Tthe consortium trading as the Telegraph Construct; and Maintenance Co (manufacturers of the Atlantic Telegraph Cable laid on an epic voyage by BruneI’s leviathan the Great Eastern), Maudslay Sons & Field (who expanded to this site in 1865 and were builders of innovative marine steam engines for, among many other ships, BruneI’s Great Western of 1837 and also the Time Ball on top of the Old Observatory in Greenwich Park). [This is now the derelict site of Humphery & Grey’s Bay Wharf Construction Co Shipyard, Bessemer‘s Patent Steel Works then Bethell’s Chemical and Alum Works, Mockford & Co’s Chemical Manure Stores, and, right on the point, the graving dock managed by Lewis & Stockwell, which still survives, having been converted into a river water reservoir for the gas works, and is now backfilled although structurally complete. In 1874 the north east sector of the peninsula was still undeveloped, apart from F.C Hills & Co Chemical Manure Works and Bugsby’s Mill immediately north of River Way. 1.7 The South Metropolitan Gas Company (now part of British Gas) bought the vacant land between 1881 and 1885 and thereafter absorbed more to reach today’s total of 99ha. The last two major acts are, of course the construction of the two Blackwall Tunnels, the first opened in 1895 and the second built between 1960 and 1967. 2.3 To the west of the massive cast/wrought iron coal and coke jetty are two gasworks buildings of c 1900. Further from the river is the wash house and nearer is an engineering workshop. Although both buildings have been truncated in plan, neither is without a certain architectural charm: the wash house has a series of engaged piers with corniced capitals of brick on its south wall, and the workshop south wall is arcaded. Of the two, the workshop is probably more suitable for preservation. 3.1 For most of its documented history, the British Gas site has been low-lying meadows, reed beds, and marsh, constantly liable to flooding until systemic embanking perhaps as late as the early C17. Changes in the course of the Thames as yet largely unassessed for this area, will have altered the topography, possibly in a fairly drastic manner if we consider the whole period of human occupation of the middle and lower Thames catchment area. 3.2 Much of the peninsula is covered by a layer of peat (recorded in ground investigations) between about O.75m and 5.5m thick, whose upper surface is at about -1.5mOD. This peat band is likely to represent the Tilbury IV marine regression, which has been identified in archaeological contexts in London and dated to within the Middle Bronze Age (later 2nd millennium BC). Analysis of this type of deposit allows us to assess the topographic and vegetational environment in which prehistoric Thames-dwellers lived. 3.3 On the sites where it has been identified in London, the Tilbury IV peat sealed a Late Neolithic/Early Bronze Age landscape which produced evidence for cereal farming (including minor structures such as platforms). This opens up the exciting possibility that (apart from areas disturbed/destroyed by recent foundations) up to 99ha of early 2nd millennium BC landscape underlies the British Gas site! 3.4 The archaeological implications are drastic, not least because, unlike the better known types of prehistoric site that have an impact on the modern landscape, such as Stonehenge, hill forts, and barrows, the sort of occupation site that might be, found here is more likely to be the remains of a temporary shelter and/or a scatter of stone/flint tool fragments and food bones. It is therefore almost impossible to predict the locations of such sites, although a thorough analysis of the ground investigation data for the area should give some idea of the’ topography at that period and hence areas that might be more likely to be ‘settled or otherwise used in an archaeologically recoverable way. That said, the importance of investigating a broad spectrum of the landscape must not be minimised, and it should be noted that piling is just as destructive of these types of deposit as deep excavation: in other words almost any typical ‘brown land’ foundation method will result in a total loss of the archaeological deposits. 3.5 Furthermore, slight though such remains as discussed above are, they represent an important (and often much neglected through their difficulty of recovery) part of our heritage and, imaginatively interpreted and displayed, can add to the ‘sense of place’ that is so crucial to the successful establishment of a largely new residential area such as is planned here. 3.5 Without the detailed study of the early topography of the area mentioned above it is difficult to estimate accurately the archaeological potential of the later periods up to the seventeenth century (by which time the river wall seems to have been in place), particularly as virtually no stray finds have been recorded which might offer some clues. One which was recorded (in 1948) from the northern edge of the peninsula was a find of C4 Roman pottery (one complete and one broken ‘vase’ from a depth of 7.5m), which need not indicate more than a relatively casual loss, possibly from a passing ship. 3.6 We must now return to the Armada bastion. Because the original plan was drawn at such a small scale (1: 63 360) it is difficult to go further than a location to the nearest 6ha. It is, however, clear that English Heritage will object most strenuously to development within that area without at least a full-scale trial excavation, which is likely to cost about £20,000 and take between one and two months to complete. Once the site is found, a major excavation will be required, costing perhaps £0.25M and lasting possibly three months. Post-excavation processing can be expected to cost virtually as much again. [It is difficult to be more precise at this stage, but these figures give a reasonably accurate view of the likely financial and time costs involved. The bonus, of course, is a site of enormous heritage potential and with major promotional possibilities.] While the visible remains, when uncovered, will .be disappointing to those unfamiliar with excavated structures, it will be entirely possible to recreate an accurate replica either on the same site (which is now perhaps 70m back from the modern river wall) or on the present river edge. 3.7 The opportunity should be taken, while groundwork’s are proceeding, to carry out a series of fairly small-scale investigations of the early river wall(s): we do not know at present when embanking first took place in this area, or indeed whether or not it was systematic or piecemeal. All these questions are, in theory, answerable, but it is more likely that we will be able to recover only part of these answers. Nevertheless, that part will be very valuable for building the overall picture. 3.8 Finally, the one thing that can confidently be predicted is that during these investigations we will find something that is completely unexpected, and that is supremely difficult to build into a budget or timescale. The Ammonium Sulphate Storage Shed: Performance Possibilities. Virtually every new performing arts structure, and especially those for music, has proved to be acoustically inadequate (eg the Royal Festival Hall). It is therefore exciting when a building becomes available that has excellent acoustics to start with and does not need expensive modifications. Here some combination of materials and three-dimensional geometry has offered an ideal venue for the performance of early music (for instance Monteverdi’s works could for almost the first time be performed in exactly the way they were designed (both tonally and locationally) for San Marco in Venice, where groups of musicians and vocalists were scattered around the galleries of the church), and also for modern ‘electronic music such as Stockhausen, Boulez, and the Paris-based Institut de recherche et de coordination accoustique/musique (IRCAM). The purity of the reverberation here should be stressed-unlike some halls it does not distort the sounds, which means that both early (including Mozart and modern (eg Berg’s Lulu) operas would perform well here. Indeed, there is very little that .is put on at Glyndebourne that could not be put on here. It is, however, easy to ruin acoustics-soft fabrics and carpets are particularly absorbent, as, indeed, are audiences. Therefore, while portable dampers may be required for some types of performance, every effort should be made to retain hard surfaces. In addition, as little as possible of the air volume should be occupied, so that while the audience seating platform will probably require a slight rake it should be no more than 2m from front to back. It would also be advantageous to have as few permanent structures as possible, including the seating; in this way the utilisability of the building. Author marymillsPosted on August 10, 2013 October 23, 2014 Categories distributors, Document, General, IndustriesLeave a comment on Future of the gas works site. 1980s. Based on lectures given before the Society by Mr. Bartlett in January 1960 and December 1963. ANTIQUARIANS have always been interested in the remains of ancient trades and manufacturing activities but the factories railways, docks and other constructions which since the Industrial Revolution, have gradually replaced the small craft workshops and primitive industries of earlier days have long been regarded as the curse of archaeology and the destroyers of much of beauty and without historical interest. With the passage of 200 years however the earlier examples of industrialisation have themselves acquired an historical importance and “industrial Archaeology” as a special branch of study has been born. Greenwich has preserved much of traditional antiquarian interest among its ecclesiastical secular and domestic building and this is in some measure clue to the fact that, when wide-spread industrial development took place in the lower Thames in the 19th and 20th centuries there was within the Borough a large and almost inbuilt area with a long river frontage. in which it could take place. It is the changes which have occurred in that area known as East Greenwich Marsh and its waterside which are the subject of this paper. In considering the development of the River Thames below bridges, and its trade, one must not lose sight of the fact that until a few hundred years ago the Lower River was for the most part a good deal shallower and,at high water, much wider than it is today. Its banks were generally low-lying and at each high tide the water spread itself for a considerable distance on either side thus rendering much of adjacent land unsuitable for the erection of buildings at least by methods then current except in the comparatively few places where there was a natural bank of firm ground. It was largely a marsh and so were Lambeth, part of Bermondsey, much of Rotherhithe, The Isle of Dogs, and most of what is now East Greenwich. And below down to the estuary, there were, and indeed still are, areas of unreclaimed marsh and saltings. For the Lower Thames there are records from the 11th century onwards of Commissions appointed to survey and make repairs to the banks, but often early efforts in this direction were more or less isolated attempts by individuals to protect their property. Then in the 17th century came the importation of Dutch engineers, with plenty of experience, to carry out the building of walls and embankments at various places on the lower River and they did excellent and lasting work. Nevertheless as recently as 1770 there were no locks on the upper river and, though certain pound locks were afterwards constructed at Maidenhead and above, the large range of locks on the Thames upper reaches which we know were not built until 1815. The River’s earlier flow was thus virtually unregulated. The Thames Conservancy was not established until 1857 and up to that time, the authority over the River rested with the Crown. The setting up of the Port of London Authority to take control of the river below Teddington, where the tidal flow now ends took place only as recently as 1909. In the London area drainage of adjacent lands was for in the hands of Courts of Sewers which were annually elected. Later to form the Metropolitan Board of Sewers and this became the Metropolitan Board of Works in 1855. That body was the direct forerunner of the London County Council formed in 1888. The other matter to be borne in mind when considering trade on and near the River is the nature and rate of flow of the tide. On the lower Thames the current is at certain times strong but not so as to interfere seriously with navigation. The speed varies at different localities but somewhere about four knots on the full strength of the ebb is about the maximum. The rise and fall of the tide is about 20 feet at springs and I0 feet at neap and, so far from tidal conditions being a disadvantage London watermen have for generations saved much time and effort by making intelligent use of them. Nevertheless there have been proposals from time to time to construct barrages at a variety of places on the lower Thames to convert the reaches above into a tideless waterway. The first such scheme was put forward in the latter part of the 17th century and in 1793 there was plan to cut a new channel for the River across the Isle of Dogs. ‘The “Marsh” was a broad tongue of low-lying land some 500 acres in extent. its southern base being approximately a mile long on the line of the present Woolwich Road and extending on the west to the eastern boundary of the old Royal Palace, and on the east to Lombard Wall, The boundary between East Greenwich and Charlton. Northward it extended about a mile and a quarter to Blackwall Point or Lea Ness as it was originally known in the 15th century. William Lombard, John’s son and the antiquary, purchased Thistle croft in 1564 but exchanged it later for land further west in Greenwich where he built his almshouses. Kimball in his “Greenwich Charities” records that in the 37th year of the reign of Henry VIII (1545-6) an Act of Parliament was passed to enforce each and every land-owner of Combe Marsh in the parish of East Greenwich to pay and contribute from time to time towards the expense of repairing, maintaining and supporting the sea-wall, embankments, etc. At this period, too, there are references to the King and others hawking on the Marsh. Lambarde’s Wall (designated by that name in 1555 but now known, by a typical corruption as Lombard Wall) was an embankment constructed in the middle or the 16th century by William Lambarde, whose Manor of West Combe included some land in the east of the Marsh to prevent the flooding of his property. The “wall” may still be seen within the land belonging to G A Harvey & Co. In 1597 Anthony Roper son of William and Margaret Roper of Well Hall, and grandson at Sir Thomas More, left land and tenements at East Greenwich for the benefit of the poor of Farningham and other places in Kent. Included in the land were 30 acres near Horn Lane, later known as the “Ashfield.” and about 12 acres near Arnolds Sluice of which a portion was reed beds outside the river wall. At some time before 1600 the River broke its banks quite extensively at a point roughly half a mile south-westward of the Point and this is referred to in subsequent documents and maps as “The Great Breach.” or “Horse Shoe Breach.’ The bank was never repaired along its original line but a new river wall was later made in a large loop to the eastward and this is the line it follows today. In the early 17th century a Court of Sewers for East Greenwich was set up to regulate the work of drainage or the Marsh and to apportion the liability for the work among the various owners and tenants. The minutes of this “Marsh Court” are still in existence from 1625 in the possession of the Greater London Council. In 1620 a number of parcels of land bordering the north side of Woolwich Road between Marsh Lane and Horn Lane were left by William Hatcliffe for the benefit of the local poor and Kimball in 1816 records that the feoffees of Hatcliffe’s Charity were still subject to the payment of a rate or assessment called “the wall scot” as adjudged by the Commissioners of Sewers of Greenwich Level. The word “scot” was applied generally from very early times to a charge levied on a landowner or householder for local or national purposes and prior to the Reform Act of 1832 his payment entitled him to his vote. The origin of the saying “scot free’ can also be seen here. A lane existed prior to 1638, starting from a point opposite Conduit Lane (the present Vanbrugh Hill) and running north-eastward through the centre of the Marsh, as does its present-day successor, Blackwall Lane. It continued by a winding course to the riverside near the end of what is now River Way, where a mill later stood. From a point rather more than half way along this course a footpath, which eventually became a narrow lane, ran north-west- ward along the line of the present Dreadnought Road and then north towards the tip of the Marsh. This almost certainly followed, at least in part, the old “Drove Way.” At the end of the 17th century the southern portion of the road was referred to on Travers’ map as Green Lane and on Rocque’s map of 1746 it was shown as Marsh Lane. Indeed that name was used in a deed of the reign of Charles I. In 1789 the trustees of Hatcliffe’s Charity leased to John Andrews for 50 years two acres of “garden ground” at the corner of Marsh Lane and Woolwich Road and “two messuages standing thereon called the; Marsh House and Crooked Billet.” Later still the lane was called “Ship and Billet Lane” after the inn built, and since rebuilt, at the corner of Woolwich Road. The “Ship and Billet” tavern was, in the early part of the 19th century, a quite pretentious looking house with a tea-garden and a bowling green attached to it. Rocque’s map shows a path by the River’s edge but the only other access deep into the Marsh was in the east where Horn Lane (referred to in 1555 as “Horne- wall”) ran and still runs, towards the River in a north-easterly direction from a point on Woolwich Road nearly opposite the site of the old farmhouse of East Combe. In the reign of Elizabeth I letters patent had been issued appointing a Steward of the Lordship or Manor of Pleasaunce in East Greenwich and the Manor then included eighty or more acres of “Marsh Lands.” These were on the western side of the Marsh and were part of the demesne of the Lordship, known as the Manor of Old Court, which from the time of Henry III was owned by the Crown. In 1674 a reversionary lease of the Manor of Old Court was granted to Sir William Boreman and in 1698 his widow sold this to Sir John Morden. In the following year Sir John purchased the freehold from William and land on the Marsh still provides the Trustees with income which is devoted to the upkeep of Morden College. A plan of 1734 described as “a particular of lands late of Sir William Boreman” still exists’,’ and it also shows some interesting and unusual field names: Pound Marsh. Foster’s Hole. Pond Meadow, Balsopps or Bishop’s Marsh, Hawk’s Marsh, Goose Pool. Dog Kennel Meadow, Crabtree Croft, Lady Marsh, The Pits and, most peculiar of all, Catt’s Brains: although this last was strictly outside the Marsh area as it was the land on which St. Alphege’s Hospital now stands. It is on a map made by Timothy Skynner in 1745 and adopted by the manuscript by the late J. M. Stone in Greenwich Borough Library and see the Library of the Drapers’ Company. In Buckinghamshire and adjoining counties where this name is common it attaches to land consisting of rough clay mixed with stones, i.e. in appearance somewhat like an animal’s brain. The Court of Sewers in the following year shows the south-eastern portion of the area (known as Coomb Marsh) as “Singles’ and the rest of the peninsula (known as Land Marsh and New Marsh) as “Doubles.” The annual drainage rates levied on Doubles were twice those on Singles: for example in 1704, 12 shillings per acre and 6 shillings per acre respectively. On Travers map the only buildings shown upon the Marsh are the “Watch House,” which stood in the centre of its northern part approximately equidistant from the eastern, northern and western edges, and the “New Magazine” which stood on the western shore just north of Bendish Sluice. There is a record in 1759 of a petition by the inhabitants of Greenwich concerning the state of the Powder Magazine “a quarter of a mile distant from their dwellings,” asking for its removal in view of its dangerous condition. It was however, still there in 1794 but probably not in use, as by then the practice was to store gunpowder, for greater safety, in hulks moored in the River. In 1802 the old buildings were purchased by Henry Vansittart and later demolished. A part of the tideway about half-way along the eastern side of the Marsh carries tile name “Bugsby’s Hole” and the whole reach of the Thames between Blackwall Point and Charlton is known as “Bugsbys Reach.” Similarly. The adjacent part of the Marsh is found referred to as “Bugsby’s Marsh (es)” but no record seems to show who this Bugsby was. However. The term “Hole” has long been applied to a part of a tidal river or creek on the inner side of a bend where craft of moderate size could lie afloat at anchor in a sheltered position and out of the way of other traffic. There is a Church Hole at Erith and a Haven Hole at Canvey. It thus might be that the name derives from an early mariner or ship-owner who made habitual use of this part of the river to moor his vessels but who had no particular local connection otherwise. The Hole is still used to moor tiers of lighters. Near here in River Way are what are probably the oldest buildings now existing on the Marsh, namely the “Pilot” tavern and the row of cottages beside it. A stone in the tavern wall bears the inscription “Ceylon Place. New Pier, Greenwich 1801,’ referring to the then name of the lane and probably to the replacement of some earlier landing stage. A public causeway existed here very much earlier, no doubt for the use of persons having business with vessels anchored in the “Hole.”. The mill at the north-eastern side of the Marsh at this point, referred to above, first appears on the 1844 map but it definitely existed in 1837 and probably much earlier. It was known as Patrick’s Mill and was a windmill but it also had some kind of provision for working as a tide-mill for, on the landward side, there was a large impounding pond. Whether it was ever used as a drainage mill, as those in Holland, Norfolk and Lincolnshire is doubtful but the 1844 map shows it simply as “grinding mill.” It had disappeared by 1885. By the early middle ages shipbuilding had become a very important industry on the Thames. Henry V is stated to have built here and in the 15th century large vessels of 500 to 1,000 tons for his Fleet but at that date almost all ships were armed for defence and were used also as trading vessels. It was not until 1513 that Henry VIII established the first Naval Dockyard at Deptford and, shortly after wards, another at Woolwich, both of which built merchant ships however as well as purely war vessels. Many of these ships carried elaborate figure-heads and an interesting ancillary industry, now quite extinct, which existed at Rotherhithe and Deptford from about 1600 for the next 250 years concerned the making, painting and gilding of these figures. Indeed there was a Guild of Carvers located at Rotherhithe who specialised in their production. With the coming of the Industrial Revolution wooden ship-building started to decline from the beginning of the 19th century, iron took its place and the trade gradually moved to the North of England nearer to the sources of material. However, in the meantime many iron ships were built and launched at Greenwich and at Deptford, Millwall and Blackwall. In the middle of last century a firm called “The National Company for Boat Building by Machinery” was building small vessels up to 100 tons at an East Greenwich yard opposite to where the Tunnel entrance now stands. This site was taken over in 1865 by Maudslay Son and Field which had been founded in 1810 by the distinguished engineer. Henry Maudslay, doing general and marine engineering at Lambeth. Maudslay’s continued building quite sizeable ships at East Greenwich until 1872. The building yard was then converted into a boiler works until rising costs in London obliged it to close down in 1900. Some general engineering was also done and parts of the original “Great Wheel” for the Earls Court Exhibition were manufactured there in the 1890s. As sail gave way to steam, marine engine works, as well as boiler-making works were set up on Thames-side. John Penn & Co. at Deptford and Greenwich were one of these and this firm later became part of the Thames Ironworks and Shipbuilding Co. who in 1911 launched “Thunderer,” the last battleship built all the London River, from their yard at Bow Creek opposite Blackwall Point very close to where Scott Russell & Co. had built “Great Eastern” sixty years before. Before we leave shipbuilding we must mention the construction of specialised craft for use on London River itself. The Thames sailing barge was without doubt one of the most interesting types of craft in the history of shipping, but now rapidly becoming ex tinct. These beautiful vessels, for so long a characteristic feature of the Greenwich river scene, ranged in size from about 75 to 150 tons –up to 300 tons for coasting work-and so cunningly rigged that they could be handled by a man and a boy, with a third hand for the larger coasters. Starting about 1750 they were built in all kinds of places on Thames-side where a small piece of firm ground was available and Henry Shrubsall, Piper and Norton, all of Greenwich were among the well-known barge-building names. Shrubsall’s yard was to the south-west of the Point and on the Ordnance Survey map of 1880 a barge builder named Edmunds occupied some sheds close by, just to the south of the present Drawdock Road. On the 1894 map he was still there and a portion of the road was known as “Boat Slip Road.” The yard was later taken over by Humphrey & Grey (Lighterage) Ltd., which in turn was absorbed by Hay’s Wharf Ltd., who maintained it as a barge repairing yard until about 1945 when the business was removed to Bay Wharf half-a-mile further up river. The original property at Point Wharf is now tenanted by Thos. W. Hughan & Co. Ltd., who still use it for barge repair work. Norton’s barge-building yard was at Pear-tree Wharf on the eastern side. In 1894 also there was a dry-dock at Blackwall Point owned by Jn. Stewart & Co., but it has since been closed and converted into a reservoir for the South Metropolitan Gas Co. Tar Works. Thames barges carried all kinds of bulk cargoes cheaply and effectively. They were flat bottomed and drew only a few feet of water, they could thus berth in all manner of odd places and sit upright on a beach or on the mud without harm when the tide was away. Despite their bluff bows and fiat bottoms they could make a remarkable speed-up to 12 knots in favourable conditions . In summer they frequently carried hay and straw from the Essex fields to London: they could sail up a tiny creek to load and then come majestically home with an enormous ‘Stack built up on board and the skipper steering “blind” to the instructions of his mate or boy standing on top of the stack a dozen feet above him. At one time there were about 8.000 Thames sailing barges registered but today there is only one-‘Cambria’ re-sheathed and re-fitted and kept by Everards of Greenhithe as an example of her type. The same firms which built the sailing barges often constructed another specialised craft, indigenous to London’s tideway, dumb barges or lighters, built originally of wood but, later, of iron and carrying up to 150 or 200 tons. They are towed by small tugs per mitted by River Regulations to take not more than six at time in two tiers of three, but they can also be manoeuvred singly by one man very skilfully using a long oar called a “sweep.” There are still 800 or more in service. In mediaeval times and earlier there were great quantities of fish in the Thames and there is a story of the apprentices of London complaining because they were given too much salmon. There were still plenty of fish in the River or in most parts of it, up to perhaps 150 years ago but with development of the riverside industry the water became progressively dirtier and the fishermen had to go further downstream to find even the whitebait for which Greenwich was long famous. A paper read before the Society in 1915 mentioned large fishing fleets based at Greenwich in earlier days and quoted Domesday Book as referring to Greenwich as a fishing port. I incline to think however that these fishing fleets worked to London for their market but owing to the congested state of the River, they then dropped down stream to anchor after discharging their’ cargoes. The first place where the River widened was Greenwich where there was more room to lie and here crews made their homes. Some of the earliest deep-sea fishermen certainly did; they went out to the North Sea and particularly to the Dogger Bank in Thames-built smacks and by 1840 Greenwich men were going as far afield as Iceland and the Faroes for their catches. Not only did local fishermen go after small fish: they also sailed in pursuit of bigger creatures –whales in fact. Whale-catching was flourishing in the 13th century in the Bay of Biscay but as the quarry got scarcer English whalers were going north as far as Spitzbergen in the I6th century and to Newfound land in the 17th. A hundred years later Thames ships were bringing whale-blubber back from the coast of Greenland to Howland Dock, Rotherhithe. Then about 1840, when northern waters were starting to become denuded of whales the Enderby brothers fitted out their ships at Enderby Wharf at the south-western side of Greenwich Marsh, for expeditions to the South Polar Seas. This enlightened local firm employed some of the most enterprising seamen of their day and encouraged and even instructed them to pursue discovery as well as profit by whaling and scaling. Among their skippers who left their own and their employers’ names permanently in the history of Antarctic exploration were James Weddell who in 1822-4 with two ships, the 60 ton Jane and the 65 ton Beaufoy, penetrated to latitude 74° 15′ S., further south than any ship went for many years afterwards. John Biscoe also with two ships -Tula a two-masted brig of 150 tons and Lively a single-masted cutter of a mere 50 tons-crossed the Antarctic Circle on the Greenwich Meridian in 1830 and was “rewarded at last on 28th February 1831 with a view of black mountain summits standing out above the ice-covered land and called it after his employers ‘Enderby Land’. John Balleny in 1839 was the first to discover land to the south of Australia and New Zealand. The three brothers, Charles, Henry and George Enderby had also founded a rope and canvas factory in 1834 but this was burnt out in a large fire in 1845. Rope making was a natural riverside industry to meet the cable and cordage requirements of the ship-building and ship-repairing trades and many rope-walks were set up along the waterside. Cable Street (Stepney), Ropery Street (Limehouse) and Rope Yard Rails (Woolwich) still provide evidence, and there was a very extensive one in Henry VIII’s Deptford Dockyard, stated to be “replete with all the most up-to-date devices for spinning hemp and making ropes and cables for the service of the Navy.” By 1847 iron had become available drawn into the form of wire and a Camberwell firm, Wm. Kuper & Co., established a factory at Morden Wharf, Greenwich, to make wire ropes, much stronger than those made of hemp. Kupers were bought up in 1854 by Glass, Elliott & Co., who took over Enderby’s old premises. Making ropes led to making electric cables. By the middle of last century the electric telegraph was extensively used for land communication and in 1850 a wire, suitably insulated with gutta-percha, was laid from England to France. It did not prove strong enough and soon broke but an iron rope embodying a core of insulated wires was more successful and this was the start of a very extensive cable-making industry. A few years after the cable had been successfully laid to France came the much bigger project of laying one across the Atlantic. Much of the first cable was made at Greenwich and the Navy loaned a warship to lay it. The laying in 1857 proved a failure and another, laid successfully in the following year, broke in a few months, but in 1864 Glass, Elliott & Co., combined with the Gutta Percha Co. to form the Telegraph Construction & Maintenance Co. and a new cable was made, also at Greenwich. This was successfully laid in 1866 by “Great Eastern,” the enormous steamship built on the opposite side of the River a dozen years earlier, which had not fulfilled its designers’ plans. Thereafter, the Telegraph Construction Co. had, over the years, a succession of cable ships at their home moorings off Greenwich opposite where the “Magazine” had formerly stood. In 1867 a gun factory known as the Blakeley Ordnance Works stood at the point of the Marsh. It failed as a commercial venture and lasted only a few years but the area is still known as Ordnance Wharf. A few hundred yards to the south of their factory, however, the company erected a large block of four-storey dwellings for their work-people, together with a row of cottages for foremen and. facing the lane, a terrace of five houses for managers, all set in the form of a square. In this early example of industrial housing the five houses were cleared away during construction of the Blackwall Tunnel (1890) but Blakeley Cottages and the Buildings were demolished only in 1948. In 1867 also there were, spread over the eastern side of the Marsh as far as Angerstein’s Wharf and Woolwich Road, a number of scattered sheds which were Robson‘s ammunition works. They remained in use until the latter part of the 19th century and there is record of an explosion in 1872 in one of the cartridge factories. From explosives we move to coal gas, the first recorded use which for lighting in London was in 1795. Soon a considerable number of small gas works, later succeeded by fewer but larger works, were set up on or near to the banks of the River. Between 1881 and 1885 the South Metropolitan Gas Co. bought a large portion of the eastern side of East Greenwich Marsh and they established vast new works where the industry grew to the enormous proportions that we know today. When the Silvertown explosion in 1917 caused widespread damage on the Marsh one of the large gas-holders in Tunnel Avenue collapsed causing a fire and other damage. The latest development is the importation from North Africa in huge tankers of liquid methane which is pumped ashore at Canvey and thence through pipe lines to East Greenwich and elsewhere, where it is blended and distributed into the domestic mains. As early as 1844 there was, just north of the “grinding mill” mentioned earlier a chemical works with a small jetty, the occupier being named in the Tithe List as Francis Hills. The nucleus of his factory was an 18th century house which survived until the last war. This area was eventually incorporated in the gas works but it still carries the name of Phoenix Wharf and continues to be used for the manufacture of chemicals. Nearby the Government established in 1917 the Fuel Research Station of the Department of Scientific and Industrial Research. An industry once flourishing on Thames- side which has virtually ceased was brick-making. From the early middle ages it thrived in localities where there were suitable supplies of day and there were numerous brickfields on both sides of the River. Most of these have been long since worked out and one of the last was on the western side of East Greenwich Marsh which was reputedly still operating in the latter part of last century. There was another sited near Pelton Road. In the ’80’s of last century also a cement works was established at Hollick’s Wharf at the end of Morden Wharf Road. which was then called “Sea Witch Lane” from a riverside tavern, the “Sea Witch” which formerly stood at the river-ward end of it but was demolished about 1920. Hollicks Wharf is still used as a depot by the Cement Marketing Co.
On the other side of the marsh, east of Angerstein Wharf, Christie & Co. have had a timber creosoting works for 70 or 80 years. A firm making another form of construction material, The Improved Silicate Stone Company, made artificial stone at the beginning of the present century on land near Sussex Wharf which is now the timber yard of Greenwich Saw Mills. Redpath Brown & Co. established a wharf and a riverside yard at the end of River Way in 1903 for the fabrication of structural steelwork and, incidentally, the Greenwich Yacht Club has also had moorings here since the turn of the century. Another old established industry on the Thames was oil-seed crushing and oil refining, Mills on the river edge dealt with water-borne cargoes of foreign oil-bearing seed: they were at first wind-driven and later powered by steam or electricity. One such mill was shown on the 1867 map at Greigs Wharf near Blackwall Point. This was held in 1880 by the London Seed Crushing Co. and was in production until about 1900. Oil leads thoughts to linoleum and the well-known Greenwich Inlaid Linoleum Co. operated from 1900 to 1935 on the site of Maudslay’s ship yard. It was then bought by Michael Nairn and Co. and manufacture transferred to Scotland, leaving only a store at Greenwich. Soap and candles. oxygen and animal foodstuffs have all been manufactured on the Marsh at different periods, but perhaps our last reference like our first should be lo a metal industry. In 1905 Delta Metal Co. moved from New Cross and built their brass extrusion mill on the Marsh on a site which had been a market garden on the 1867 map and near which in 1894 there was a Thames Police Station on a floating pier. The Delta Metal Co. now occupies a considerable area between the site of “Blakeley Cottages” and the River to the west. During its expansion this firm look over a site to the north-east on which an Ice Factory had operated during the first two decades of this century until refrigerators put it out of business, and also Shrubsall’s barge building yard and Greigs Wharf. With the incorporation of the ice factory its short approach road known as Fashoda Street was also extinguished. It will be seen that until about the middle of last century the Marsh was devoted almost entirely to agriculture and grazing except for the small residential development at Ceylon Place and a few wharves on the riverside elsewhere. On the western approach. from Greenwich, however, building had gradually spread eastward along Woolwich Road to the end of the Ship and Billet Lane and this area was known for a time as “Tyler’s New Town” and there is still a Tyler Street in the vicinity. In 1851 the first railway came to the Marsh. The North Kent Line was extended from New Cross to Woolwich by tunnelling between Blackheath and Charlton and the material excavated was used to construct an embankment running north over Woolwich Road to the riverside. The embankment, which was parallel with Lombard Wall and about a quarter mile to the west, carried a railway line to Angerstein Wharf. This was named after the owner of the land, John Angerstein, son of the builder of Woodlands and with part of the proceeds of its sale he built St John’s Church, Blackheath. The Wharf was intended originally for general goods traffic but has long been used almost exclusively for transhipping oil from lighters and to storage depots in Horn Lane. Part of it is now used as a scrap-iron yard and an asphalt company occupies adjacent land to the west of it. In the early 1900s a branch railway was built parallel with the River westward to serve the Gas Works. The biggest development of the Marsh came with the construction of Blackwall Tunnel, built by S. Pearson & Son for the LCC in 1890-97. 1n the line of the Tunnel South Approach there originally stood a row of houses facing west known as Cornwall Terrace, Margaret Terrace, Spencer Terrace and Teddington Terrace. al! being part of Blackwall Lane. At the junction with Ordnance Road stood a public house called the “Ordnance Arms.” and another called the “Kenilworth Castle” was at the junction of the Lane with the southern end of Ordnance Road which was known as Teddington Place. All these buildings were demolished to make way for the approach cutting. Up to 1890 an open watercourse. the third of the drainage channels mentioned earlier, rail northward along the western side of Blackwall Lane, past the factory frontages and the market garden. It turned sharply westward and discharged into the river just south of Greigs Wharf. When the riverside footpath, which originally ran as far as the draw dock, was diverted about 1938 it was brought out to join Blackwall Lane alongside the lower end of this ditch, the last trace of which was culverted in 1946. When the Blackwall Tunnel was completed, the new road built to carry its traffic south-eastward was named “Tunnel Avenue” and the northern portion from its junction with the original “Marsh Lane” was incorporated with it and extended to Blackwall Point. At the same time Ship and Billet Lane (the old Marsh Lane) was renamed Blackwall Lane. A service of pair-horse omnibuses started soon afterwards. running from the “Noah’s Ark” at the northern end of Deptford High Street through the Tunnel to Poplar. This was the only public transport across the Marsh until 1906 when the LCC extended the electric tramway from Trafalgar Road to the Southern entrance of the Tunnel. The horse buses were replaced by single- decker motors about 1912 and later by modified double-deckers and the tram service ceased in 1953. Plans for the duplication of Blackwall Tunnel was made and surveys begun before 1937 but work has started only recently. The second approach road will make necessary further demolition near Tunnel Avenue and will bring thousands more cars hurtling across the Marsh-a very different scene from the pastoral peace of little more than a century ago. The author wishes to acknowledge the assistance he has received from many sources in preparing this paper and particularly from the Borough of Greenwich Libraries who have been especially helpful. Also some of the information of early land ownership and field names on the Marsh is from the Presidential address by the late Mr. A. E. Greene to the Society in February 1938 which has never been printed. The map of East Greenwich Marsh at the end of the 17th. century is re-drawn from Samuel Travers’ map of 1695 with details from the Timothy Skinner’s map of 1745. Field names were mentioned in Travers’ Survey of the Manor of East Greenwich but were not shown in his map. The positions were identified by the late Mr. A 5. Greene with the aid of the Tithe maps. H appears that the only such name which has survived is Pear tree Field now transferred to a nearby wharf. The mid-20th century map of the Marsh is based on the 25 inch OS sheets. A comparison of the two maps, which are reproduced on the same scale, shows that in some places the shore-line has advanced riverwards, probably as a result of the reclamation of reed beds and mud flats and the extension of wharves. The road’ system of the 17th. century and earlier is still clearly to be seen in the roughly Y shaped pattern made by Blackwall Lane, River Way. Dreadnought Street and the north-western end of Tunnel Avenue. More modern roads sometimes follow the boundaries of earlier fields: for example Pelton Road along the line which divided The Great Meadow from Dog Kennel Meadow and Rayle Meadow. The modern map will soon be further altered by the works connected with the new Black wall Tunnel Approach. In 2002 Groundwork undertook a programme of environmental and artistic work on the riverside path – this involved partnership work with a variety of site owners, public bodies and individuals. £££££ was spent on jetties and riverside works. They produced a booklet some of which is copied below. and provide training for employment. opportunities for all to benefit from London’s economy. We have tried to acknowledge all the projects and their initators, developers and funders. We apologise if we’ve left anyone out. Should you desire further information, please contact Groundwork Thames Gateway London South on 0208-694-5000. Set against this industrial backdrop is a wealth of biodiversity. Over the last 20 years, the water quality of the River Thames has improved enormously and the river now supports 118 different species of fish. This has also enabled the Foreshore to grow in ecological value, and there are now saline tolerant plants such as the sea aster and accompanying freshwater species; invertebrates thrive in the river silt, while the industrial landscape forms an important habitat for the endangered bird; the black redstart The riverside is a prime location for arts events, attracting visitors from the local community and beyond. Recent projects have included ‘The Hysterical Walk” in 2000, the carved steps at Enderby’s Wharf (both by Greenwich Mural Workshop) and the mosaic tiles at Greenwich Power Station commissioned by Greenwich Council. Such a unique site requires a sensitive approach in terms of environmental and access improvements, where the local distinctiveness of the riverside sites is celebrated and enhanced – rather than homogenised by a major masterplan. as Groundwork. It set out a vision, rationale and programme for a strategic series of riverside enhancements between Lovell’s Wharf and Bay Wharf. The Environment Agency, Thames 21, Greenwich Council and the landowners themselves. Funding for these has come from the London Development Agency, other public bodies and the local business community. The purpose of this report is to bring together and summarise projects carried out to date and to describe those currently projected, between Lovell’s Wharf and Bay Wharf. The next step envisaged is the establishment of an independent and accountable River Group including riverfront and riverwalk users, in order to lobby for and decide upon further improvements and alterations, and the conservation/preservation of existing features. We hope that this report will act as a catalyst for interested parties to become involved. Etched stainless steel information panels have been located at both Primrose Jetty and Enderby’s Wharf, depicting in detail the industrial heritage of the East Greenwich waterfront between Greenwich Power Station and Bay Wharf. The panels were researched, designed and delivered by the Deptford Discovery Team with assistance from Mary Mills of The Greenwich Industrial History Society, the Greenwich Local History Library and the artist Peter Kent. An arts event that took place on 4 occasions in the year 2000. A guided walk, led by actors telling the story of the life of a beachcomber, connected a series of sculptures, light installations and projections, picture frames producing “paintings” of river views, music, dance and theatre. The event was delivered by Greenwich Mural Workshop and funded by Greenwich Arts Forum and the Greenwich Development Agency. The artists involved were Emergency Exit Arts, Margaret Harrison, Richard Langford, Rib Davies, Carol Kenna, Johnny Goodwin, Louis Silcott, The Simba project and TIPP.